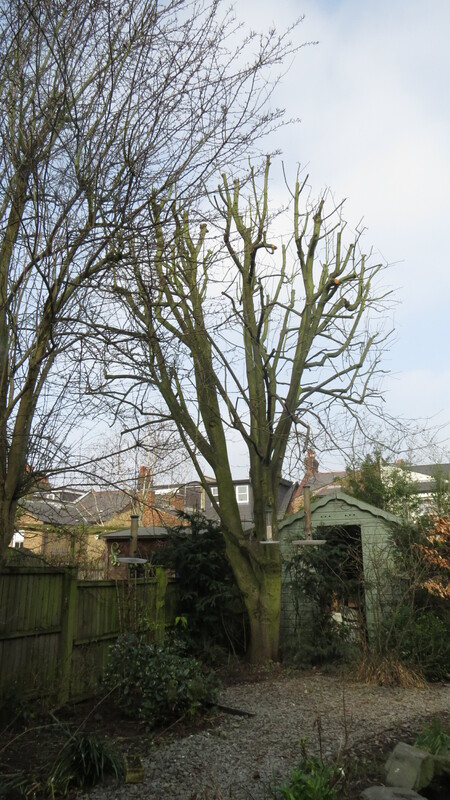 The whitebeam tree, pre-trim. The squirrel drey in the top right was uninhabited. Dear Readers, every five years I have some work done in the garden that fills me with trepidation. My whitebeam and hawthorn trees are very beautiful, but are also a bit big for a smallish suburban garden, and so I ask the tree surgeons to come in and give them a good trim. I know it sounds strange, but I feel guilty about it every time, and always apologise to the trees in advance, and try to explain what’s going to happen. 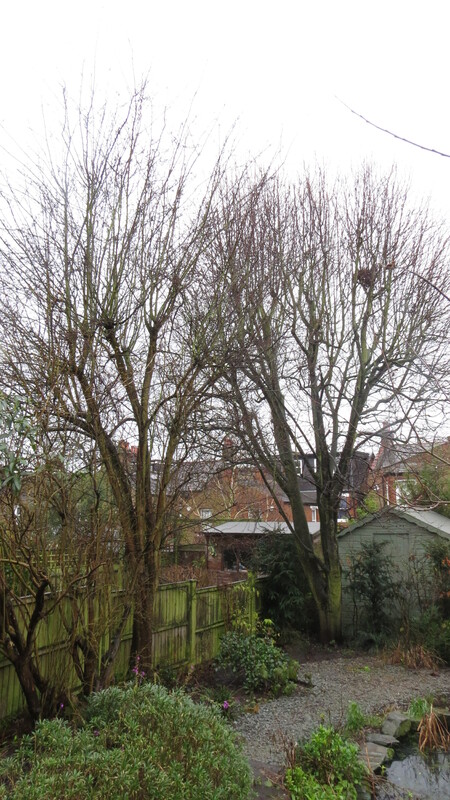 I know that both trees will take a while to recover, and that the birds will be confused about where their favourite perching places have gone. But, nonetheless, if I want to preserve good neighbourly relationships, and also to get maximum light to the (north-facing) garden, it has to be done, and early in the year before anything has really started to grow. So, the tree surgeon Michael, and his sidekick Scott, arrived, and Michael spent the next six hours in the whitebeam. In the pouring rain. He is something of an artist, taking a drawing of the tree before he starts, and preserving its character and shape as he goes (something that some of the guys employed by the council could do well to learn, though I have no doubt that those poor souls are up against a ferocious timetable). And this is the result. Not pretty at the moment, I know, but all the fundamental features of the tree are still there. And he’s even left me some branches to hang the bird feeders on, which is very important. 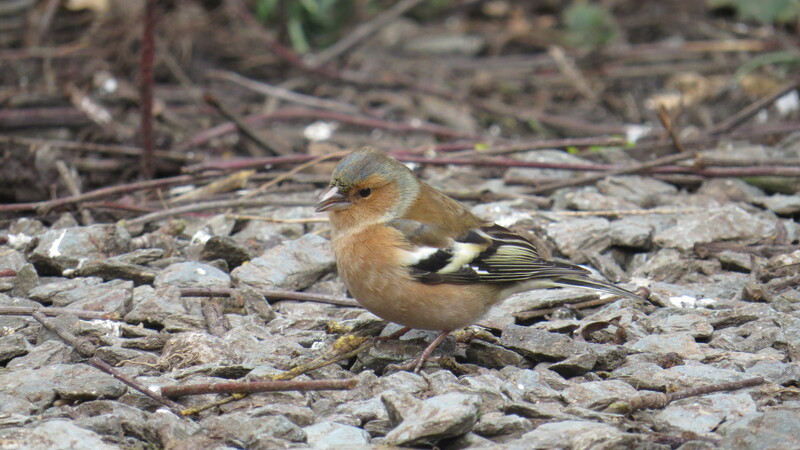 The chaffinches and collared doves and robins were very upset at their absence, but I think they’re happy again now. 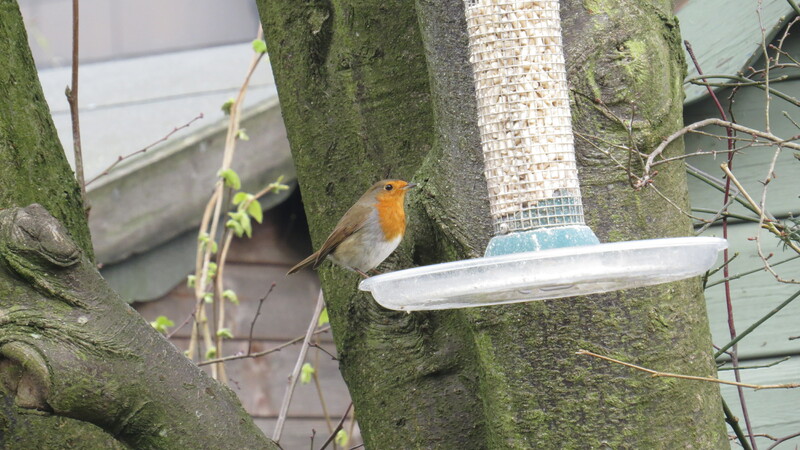 The robin has just learned how to use the bird feeder! By the time Michael went home, he was absolutely dripping wet. I do hope he doesn’t come down with some evil disease as a result. And in the evening, an annual event occurred. As the drizzle continued, a little army of heads popped up in the pond. It was as if they’d been waiting for the temperature to go up a few degrees. There had been a few males around for several weeks, but no frogspawn. And yet, when I got up, all this had been laid in one night. 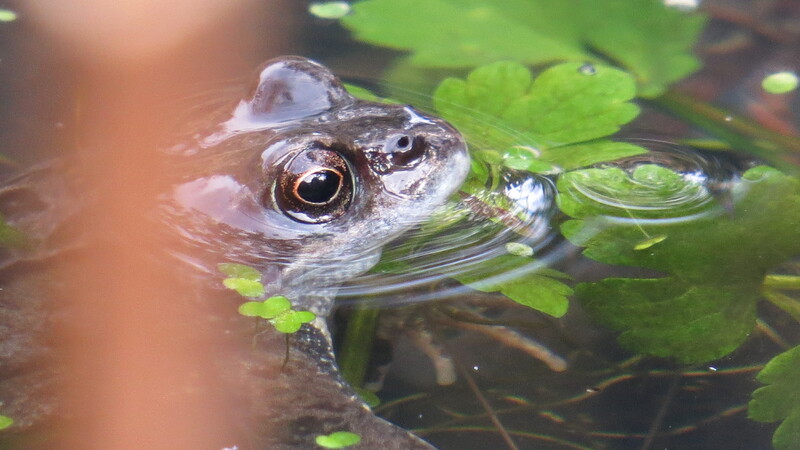 The frogs seem to like the shallow end of the pond, and once one female has laid her eggs, everyone else tries to lay theirs on top. 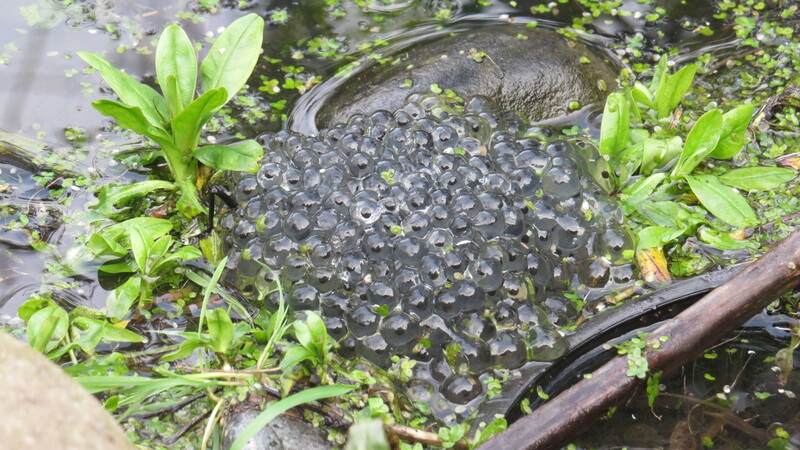 At first, each egg seems pumped full of fluid, fit to burst, but over time the eggs seem to lose their rigidity and become softer, eventually releasing the tadpoles into the pond. I had never noticed frogs’ eyes before. I love the almond shape and the golden iris. There is something so benign about that gaze, so utterly harmless. And yet, something has killed one frog per night ever since they started to breed. I find their little corpses, hands together as if in prayer, their white bellies exposed. They seem to have one tiny bite behind the head. Usually, they aren’t eaten, but today I found one that had been partly dismembered. It could be a cat, a fox, or even a crow (though I suspect that they scavenge the dead ones rather than hunt the live ones). 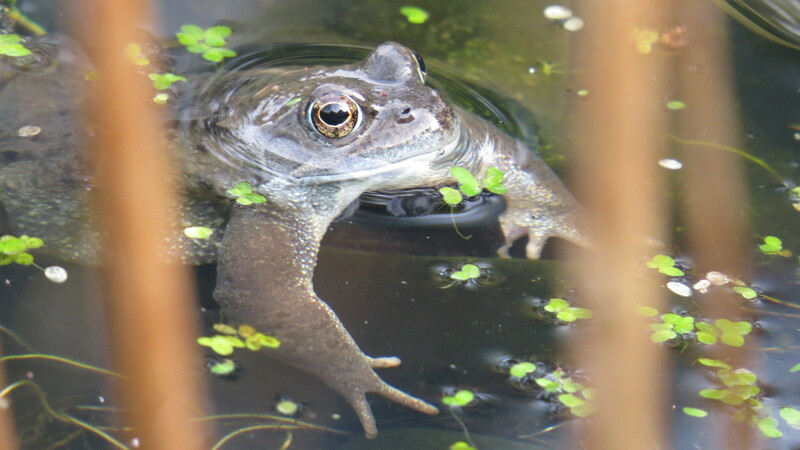 But still, there are probably a hundred frogs in the pond at the height of the season, all so intent on breeding that everything else is an afterthought. No wonder their croaking and squirming and skirmishing attracts the attention of predators. It would be strange if it didn’t. And, while this is not a cat blog, or a dog blog, I do have to share two photos with you this week. One is of my cat, Willow, who is under the impression that she is a panther. 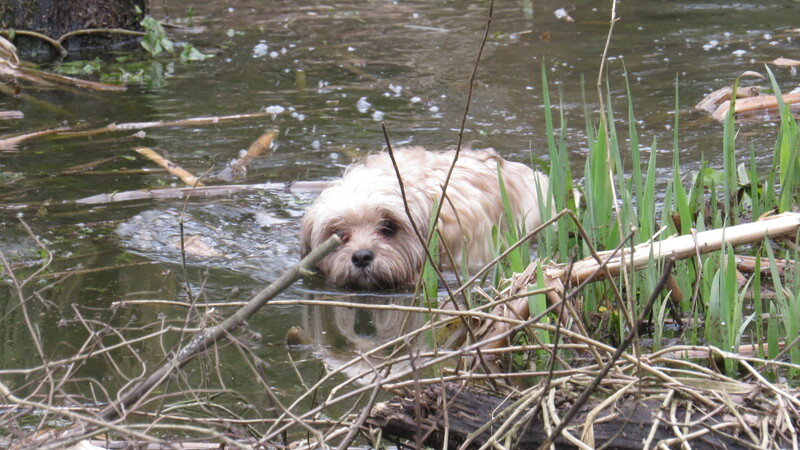 And the other is of a dog that I met in Coldfall Wood. This little one might be a ‘toy dog’ but he has the heart and spirit of a Newfoundland. I salute you, sir! 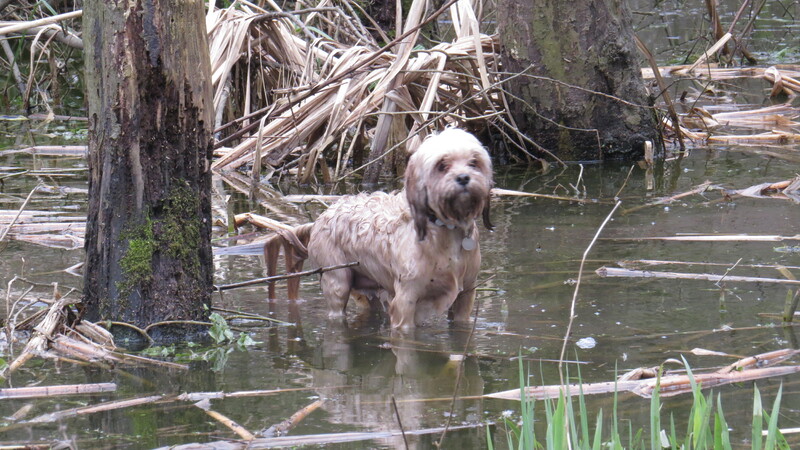 He was undaunted by the sudden increase in depth and volume of the Everglades pond, and was determined to go swimming. His owner told me that he often tries to stalk the ducks, who can see him coming a mile off and fly just when he comes within sniffing distance. I only hope that his owner had a fine collection of towels. This was one very wet dog. 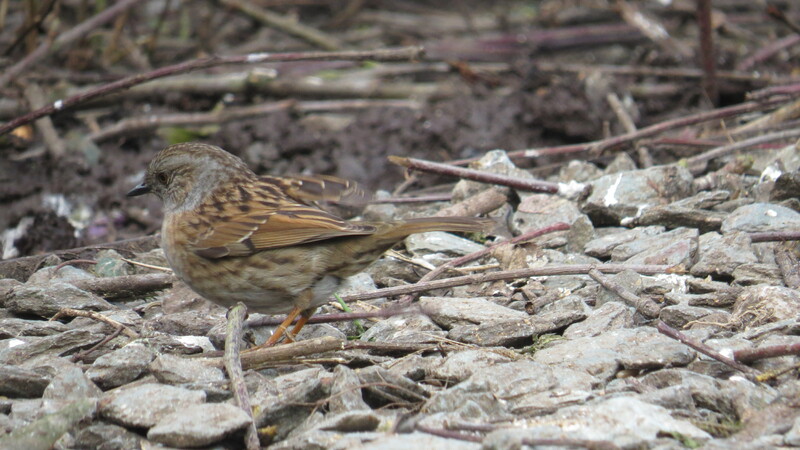 This entry was posted in London Amphibians, London Birds, London Mammals, London Plants on March 12, 2016 by Bug Woman. I agree I hate having tree work done and was going to have the hawthorn tree which arrived as a self seeder some 10 years ago, pruned a bit this spring but now it’s bursting into bud I can’t have it done…I know it would be okay as they can be trimmed as hedges in the lane outside virtually all year by the highways dept, but a reprieve for this year! 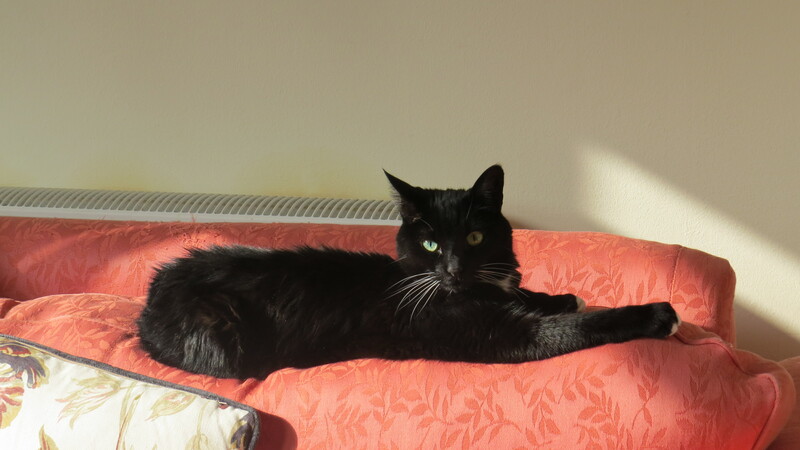 Love the frog pictures they are quite beautiful and Willow is a handsome cat/Panther!! Have you seen the poorly fox recently! Hi Anne, fortunately being north-facing means all my plants in the back garden are about a month behind the ones in the front, so the hawthorn hasn’t really got going yet. Nonetheless, I shall be relieved when it gets leaves and buds! No sign of ‘our’ fox, but the jam sandwiches are being eaten every night, so I’m very hopeful. I did see another magnificent dog fox in the cemetery this evening, but no chance of a photo. I know where he hangs out now, though, so maybe in the next few days I’ll actually catch him on camera. Though, to be truthful, sometimes it’s just a delight to stand and watch. Glad to hear you have a new fox in town to monitor…yes just watch him you can mis so much if you are always looking through a camera lens! That said I really look forward to your photos they are excellent and wondered what camera you use? Hi Anne, I use a Canon Powershot, which is a bridge camera with up to x50 optical zoom. It’s great for distance shots, but I admit to being a little disappointed at how it works for close ups of insects, etc – I guess my next step will be into the world of multiple lenses :-). I’ve seldom seen such good close-up photos of frogs. Do hope their mystery predator gets bored soon. Thank you, Ann! 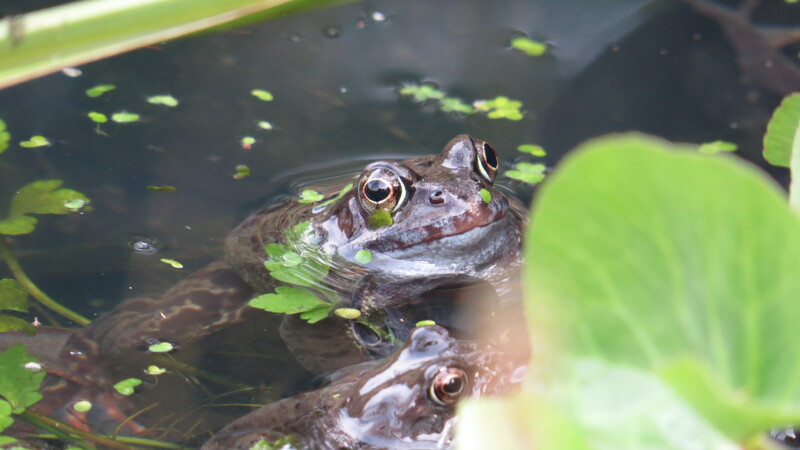 The frogs are very obliging subjects though – unlike most wildlife, they just float there, happily getting on with whatever frogs get on with. Never underestimate the beast in the most domesticated of dog! Our (long-departed) labrador was addicted to hunting down hedgehogs and carrying them back to the house in her mouth. I never understood how she managed to track down these spike balls, and even less, how she managed to transport them. Ah, amazing! I wish we still had hedgehogs in this country – I remember being amazed when we moved to a suburban house when I was fourteen, and seeing the hedgehogs in the garden. Our dog would roll around next to them and you could literally see the fleas vacating the hedgehog and landing on our hound. How clever of your labrador to manage to carry them! They are very determined when they want to transport something, aren’t they. I feel the same about my trees, consequently its a bit jungly at times in my garden. 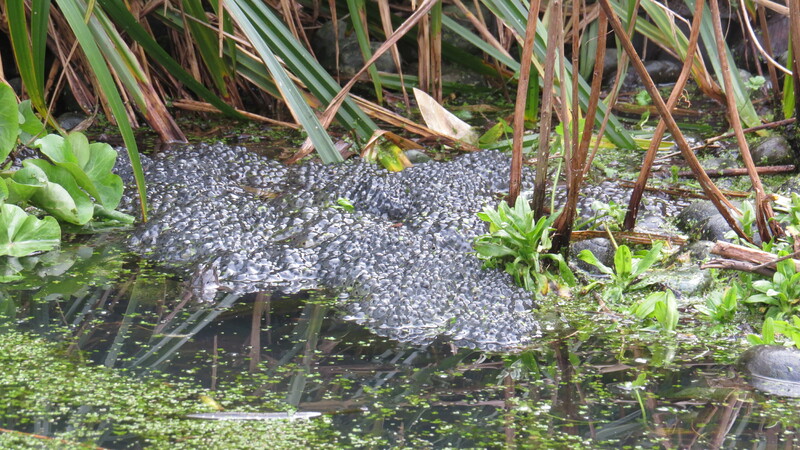 Also noticed a patch of frogs spawn in my pond, must be the advent of spring…..